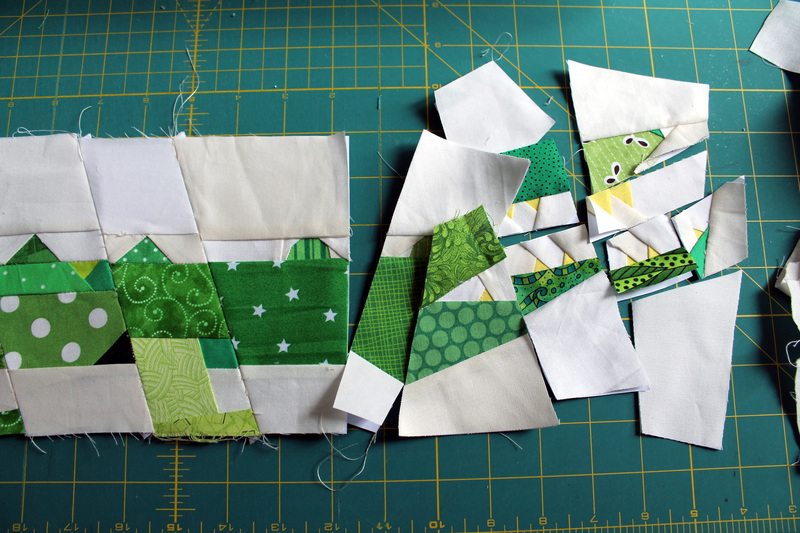 A few months ago I agreed to test a paper piecing pattern for Louise at I’m Feeling Crafty. I was thrilled when Louise sent thru the most darling Alligator pattern, in three different sizes no less. To test the pattern I decided to make the smallest version of the Alligator, my theory being that the smallest patterns are most of the time the fiddliest/hardest to make. This pattern does have a few parts to it, but Louise’s instructions are easy to follow and the design makes assemble straight forward. I used the pin method to make sure that my points aligned, and it worked perfectly. When I was done with my small Gator I had a block measuring 9 x 21 inches. 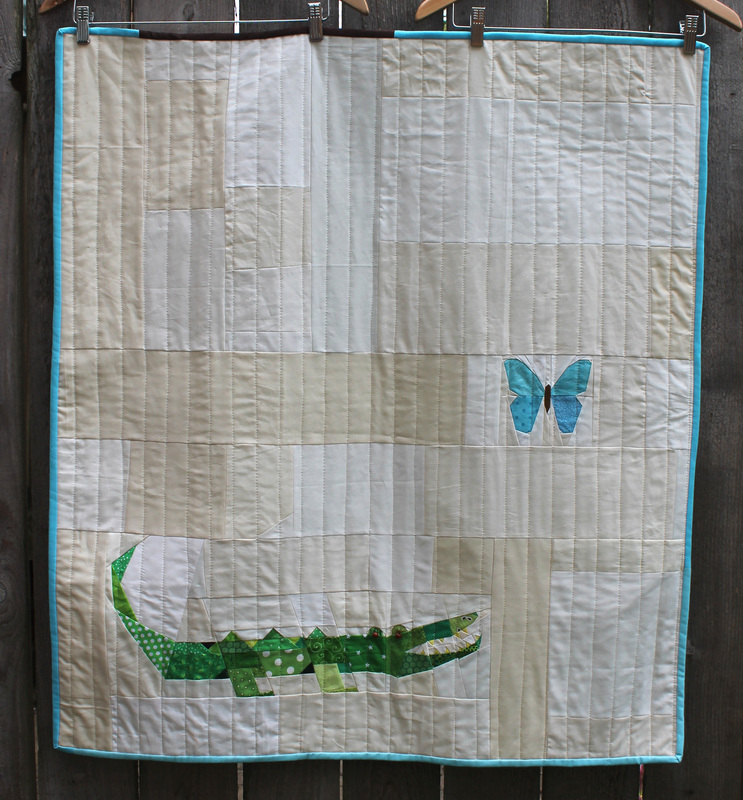 But I wanted to shake things up a little, so I put the Gator up on my design wall and started playing… a butterfly and some scrappy cream solids later I had a finished baby quilt. For the butterfly I used a paper piecing pattern I found on Craftsy. It adds such whimsy to the quilt I think. 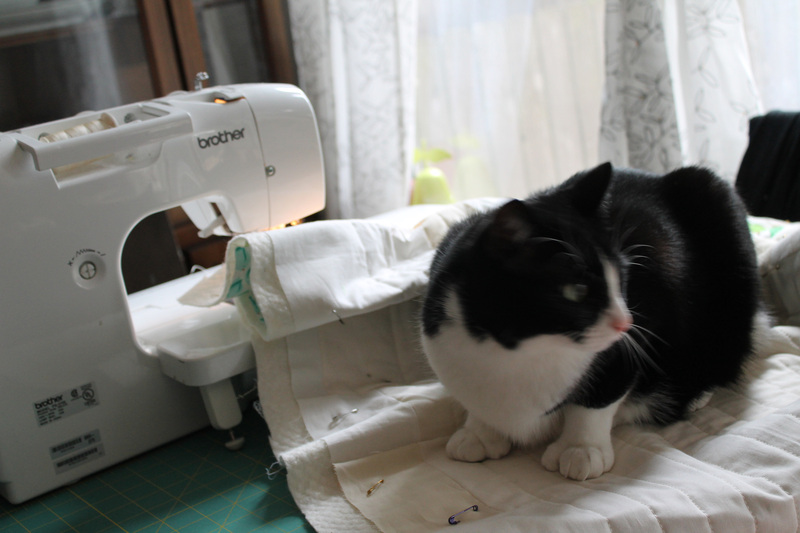 I did some straight line quilting with some kitty help… yep you warmed me last week this would happen and it did! Using the small Gator pattern this quilt ended up at 35 x 39 inches. Next time I think I will use the medium Gator pattern and add more butterflies. It is such a great block I will definitely be using it again. That is a very cute block, in all three sizes. I also love the alligator/butterfly combination! How’s Starry Night coming along? I have not forgotten Starry Night…I am having a blast making the night sky. I will lots to share next week I promise Kate. I’ve been seeing these gators pop up on IG–now I get it! 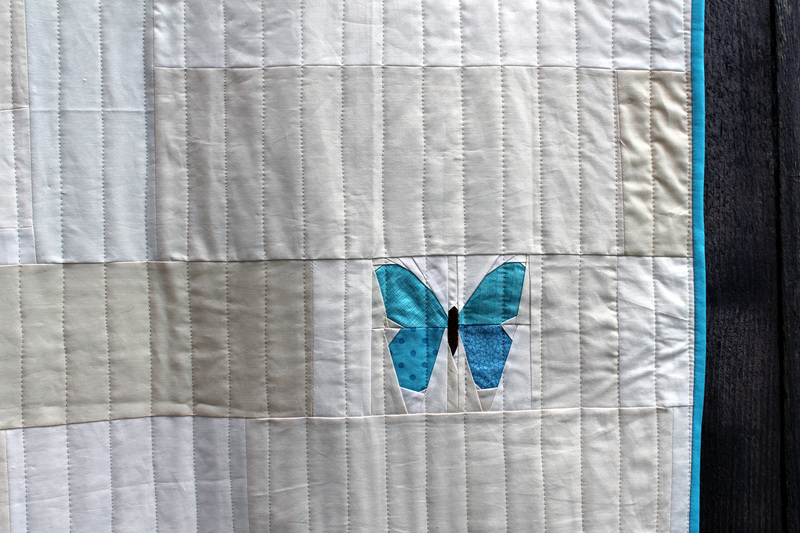 I love your quilt–the creams and that butterfly make it unique and so fun! Really cute! 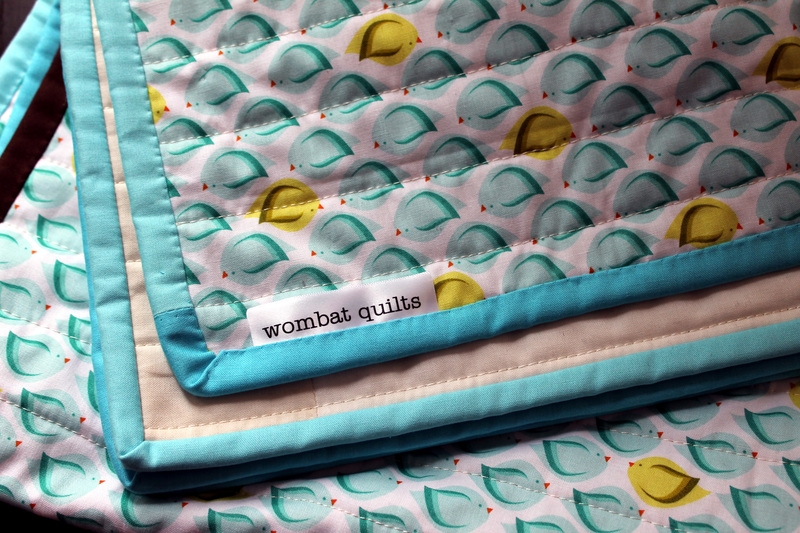 Are the buttons okay for a baby quilt? Not to be a wet blanket but always have to think of safety. But, wow! Just so darned cute. Pat I knew going in i would have to remove the buttons and embroider the eyes on before I gave this quilt to Project Linus. But I loved the buttons and had to use them initially. Debbie I think scrappy cream could be my new favorite. I did not realize I had so many different cream solids hidden in my stash! Wow- you did a great job. 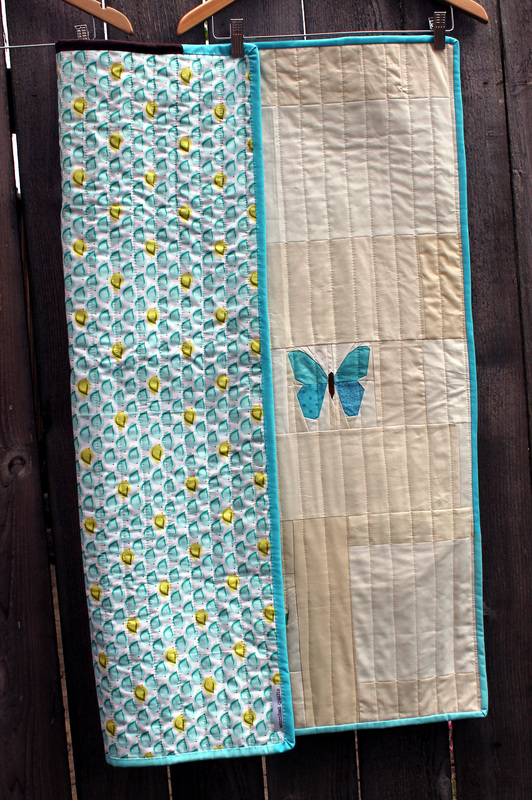 I love the blue butterfly- any baby would be so happy to have this. Fabulous quilts! We’ve just come back from a great holiday in Florida, seeing loads of gators in the wild 🙂 Will look at the pattern. 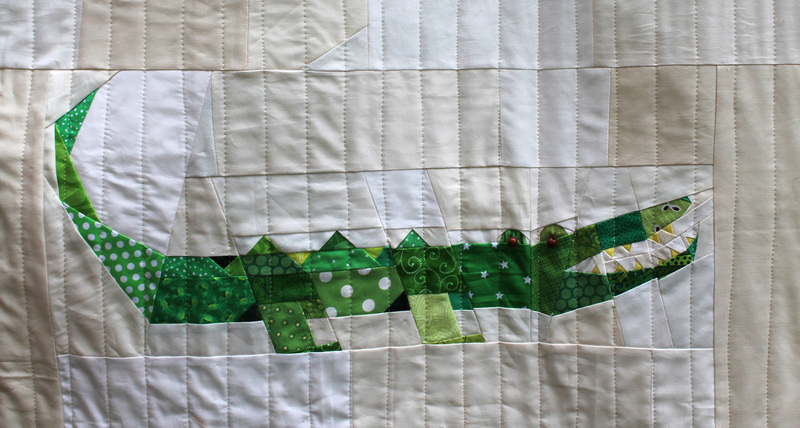 I love seeing the variations on the alligator piecing, and I really like the butterfly you added to your quilt. Alligators are my absolute fave. I love this so much!!! Adorable! Who would’ve thought alligators could be so cute? Your gator is so fabulous!! I never would have thought of pairing it with the butterfly but it’s PERFECT. Love love love! Love this variation with the butterfly. So cute. Great design, great extra touches and beautifully executed. I love your outcome! The scrappy cream is the perfect background for your gator and butterfly. Using the medium gator and more butterflies will be fabulous! Thanks for sharing! I think just the one gator and one butterfly is perfect. I am learning how to deal with the ever helpful kitty. I say no, she sulks, then returns for petting. It is like having a teenager in the house. LOVE what you did with this- just stinking adorable! 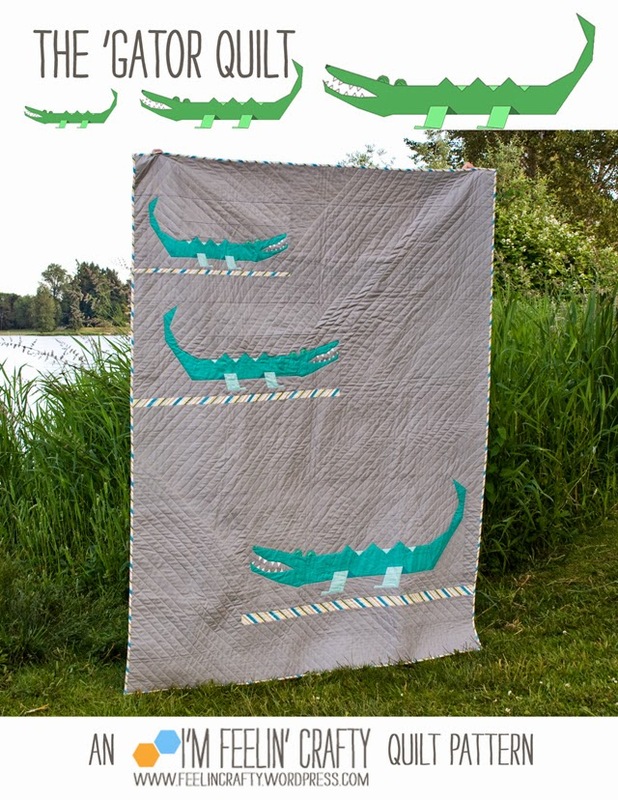 The gator and butterfly make for a great pair, the quilt looks great.